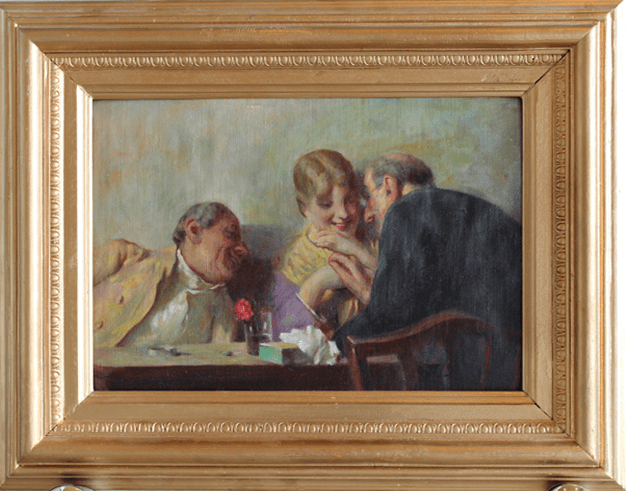 Louis Bauman, collected paintings, and spent much of his time hand crafting wonderful frames. 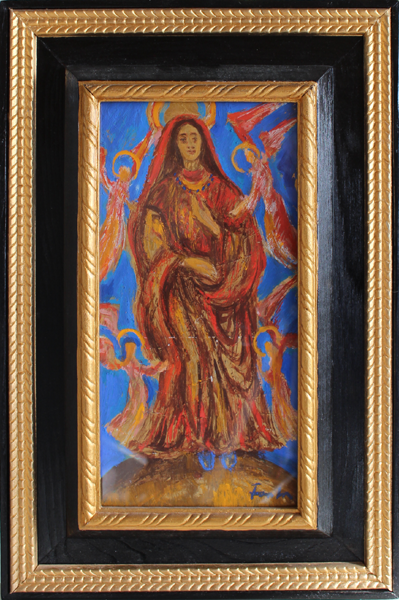 His donation of his collection of paintings and frames twill make possible the continuing funding of the St. John Bosco Private School. 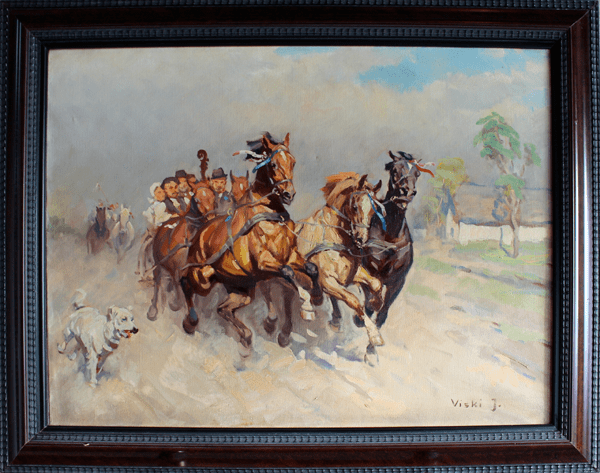 The auction catalogue lists 40+ paintings, generally in wonderful frames! The frames are indeed wonderful,, and many of the paintings are enormous, uniquely suited to a large home! Born in Hungary on March 1, 1911, Louis lived on the outskirts of Budapest during a time when the Austro-Hungarian Empire was still in existence. With sharp memories and stories of civil wars as well as two World Wars, and the political and religious upheavals of the times, one can only imagine the realities that his family actually lived through. Louis earned his doctoral degree in Botany at the University in Budapest and was a well-known speaker and author on the topic. His family owned a lumber mill in Hungary and a vineyard when they lived in Austria. They fled from Hungary when the Russian army invaded in the early 40’s. In 1951 the family emigrated from Austria and arrived by ship in eastern Canada, then traveled by train to Taber, AB where they labored on a beet farm. In 1954 Louis was employed by a construction company and a few years later, when they won a contract to build the town of Inuvik, Louis was asked to go there and supervise for two years. Oil, 27 x 14 cm. In the late 50’s with the help of friends and colleagues, he started his own successful construction company in Calgary. By the late 60’s, the family was looking for a quiet country retreat and they purchased a farmstead in Bergen. After renovations and additions, Louis brother Joe, a lawyer by trade, raised cattle while Louis continued work in Calgary. However, with Louis’ knowledge of plants and soil, they tried their hand at many crops which at the time were unknown to the local climate. And, with Joe’s expertise in law and Louis’ experience with public speaking, they took on several impressive battles: the Alberta government’s weather modification practices and the oil industries that were flaring the sour gas. In Louis lifetime, he has seen much change in technology and industry, but one thing that the family believed to be constant was faith, classical music and artwork. Therefore, during those years of prosperity, the family purchased European oil paintings, with and without frames, and since some were damaged in shipping, Louis taught himself the skill of building and repairing intricate frames. His donation, , of his collection to St.Dennis will make possible the continuing funding of the St. John Bosco Private School, which operates an Alberta-Education-accredited K-9 school, St. John Bosco Private School, which is open to all baptized Catholic children. St. John Bosco is the only Traditional Private Catholic School in Calgary. Students are taught according to the Alberta Program of Studies in a traditional Catholic environment. Very reasonable tuition, qualified, friendly staff and an enviable Student-Staff ratio all combine to make St. John Bosco Private School an excellent alternative to the public system for a uniquely “capital-T” Traditional Catholic Education. Supplementary information is available at the school website. Mr. Bauman passed away quietly on July 9, 2014.